Bulova 1976 Pocket Watch "Bicentennial"
A photo of the movement and the inside back case would help in the ID of this pocketwatch. Or print any movement stamping & Inside back case stamping listed as stamped would help. The information you say is stamped on the watch is baffling to me. the only thing I believe can be right about the watch is 17 jewels. Bulova did not make a movement or dial like this in 1976. I could be wrong, but right now I think you have one of a kind watch. I don't know what it is. Lucky Find. I think this watch is part of the "Centennial" pocket watch and wrist watch collection, released to mark Bulova's Centenary. This 1975 pocket watch ad does not show any models except Caravelles, but the Bulova Centennial line is mentioned. This May 1975 ad shows the line as being used in the new movie, "Posse" starring Kirk Douglas. The ad mentions the Centennial line as being made up from Bulova, Caravelle and Accutron models, from $29.50 to $750.00! Note that the subject watch is in a 19th. Century style, in keeping with the models used in the film. 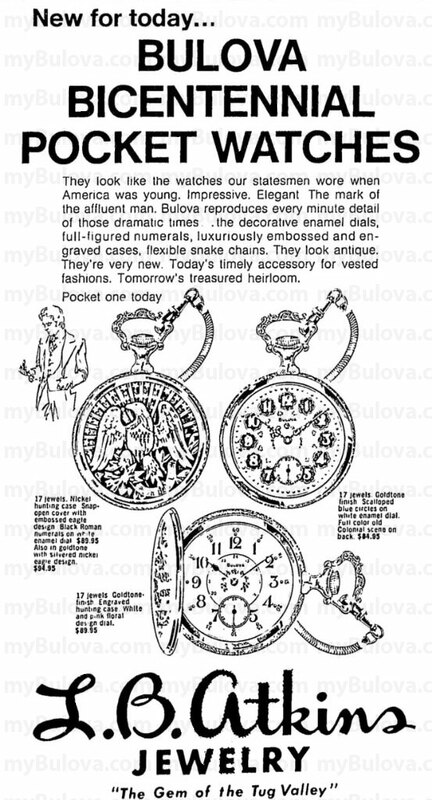 Note that the ad mentions that Bulova were selling pocket watches back in the 1890's, something I and any other searchers have yet to find proof of. Here is a non-pictorial advert for a competition, which mentions the line. "Winnipeg Free Press (Newspaper) - April 12, 1975, Winnipeg, Manitoba 101 exciting prizes! No purchase necessary. Enter at participating Bulova dealers. CENTENNIAL Contest closes June 30th, 7975 CLASSIC STYLING... PRECISION TIMEKEEPING BULOVA... trusted and treasured for 100 years ACCUQUARTZ The ultimate in precision quartz accuracy. Available In a selection of styles. POCKET WATCHES Artistic Masterpieces recreated in a limited: edition of exciting pocket or purse BULOVA GOLDEN CENTENNIAL Specially crafted to commemorate 100 years of producing -theworld's finest timepieces. VISIT YOUR NEAREST PARTICIPATING BULOVA DEALER AND ENTER THIS EXCITING CONTEST. SEE HIS WIDE SELECTION OF BULOVA TIMEPIECES IN EVERY PRICE RANGE THEY'RE ALL WINNERS. BULOVA WATCH COMPANY 106 Birtley Drive Toronto."